Click on product below for more photos and product facts. SAFE Systems portable blast vessels offer high performance with the convenience of portability so you can tackle the most demanding surface preparation jobs in any setting. 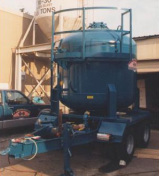 We configure our MPD portable blast vessels by the number of blast outlets to suit your production demands.